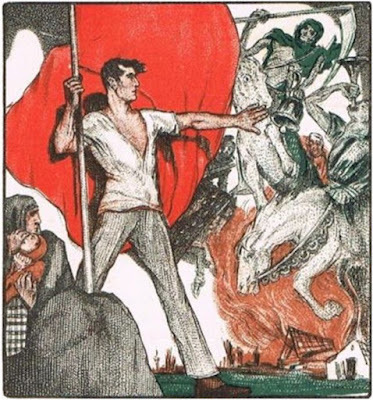 A French May Day poster from around the turn of the 20th Century. Note: Here is a version of my annual account of the history of May Day, International Labor Day. 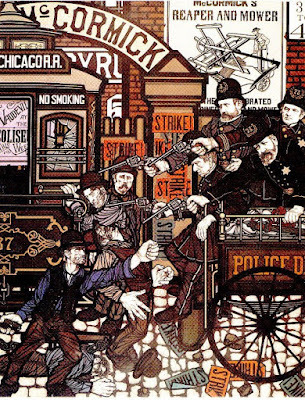 Chicago was a-boil with labor turmoil in 1886. The burgeoning city had become a major manufacturing center and tens of thousands of immigrants had poured into the city since the Civil War to join displaced American born farmers and former independent craftsmen in giant factories. Hours were long, working conditions hard and dangerous, bosses harsh, and pay cuts frequent. Since the Great Railroad Strike of 1877 tensions had been building. And so had a labor movement—craft unions loosely organized under a city central labor body, and the Knights of Labor, officially a benevolent society whose national leadership was opposed to strikes. But unlike the craft unions, the Knights would enroll all workers—skilled and unskilled alike. In addition immigrant communities had their own radical leadership and press. None was as vigorous as or developed as the Germans, who were not only the largest immigrant community in the city, but had a highly educated leadership steeped in European radicalism. Many of these leaders identified with the growing international anarchist movement. There were several major strikes ongoing in the city that spring. The largest was at the giant McCormick Harvesting Machine plant where strikers had been replaced by scabs under police protection and daily clashes were occurring at the factory gates. On May 1st workers responded to a call for a General Strike for an 8 Hour Day which had been issued nationally by the Federation of Organized Trades and Labor Unions (ancestor of the American Federation of Labor.) 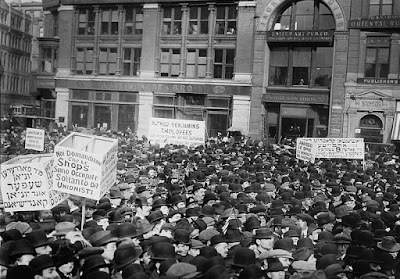 In Chicago the International Working Peoples Association (IWPA) organized a march by 8,000 workers led by Albert and Lucy Parsons, the main English language figures in the anarchist labor movement. The General Strike got so much support that even half of the scabs at McCormick lay down their tools to join. Employers were in a panic at the turn of events. They met with city officials demanding suppression of strikes and demonstrations and agreed among themselves to redouble their own efforts to violently suppress strikes through the use of the Pinkerton Agency and bands of thugs and criminals hired off the streets. 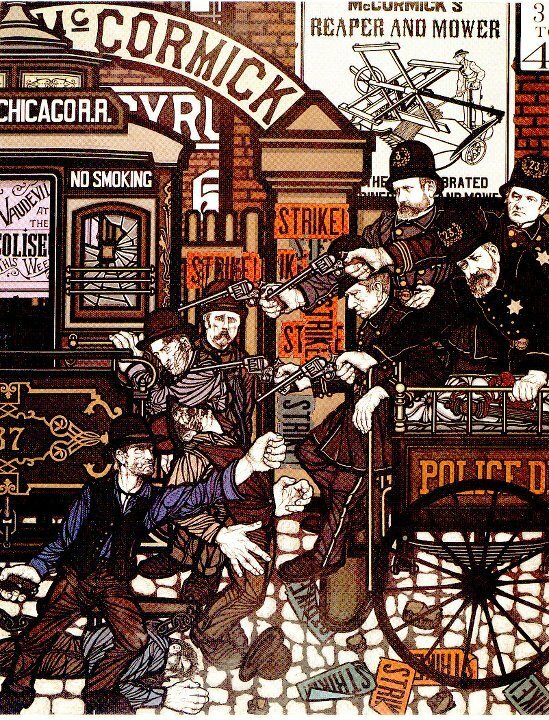 Chicago Police attack pickets at the McCormick works on May 3 inspiring a protest rally at the Haymarket the next evening . On May 3 a rally in support of striking McCormick workers was addressed by German anarchist leader August Spies. When strikers confronted scabs emerging from the plant after the 4 PM end of shift, police opened fire killing six workers and wounding scores. Outraged Spies rushed to the North Side where his daily newspaper, Arbeiter-Zeitung was published. He and his associates decided to call a protest meeting at the Haymarket just west of downtown for the next day. Flyers in German and English were hastily printed and rushed into distribution. 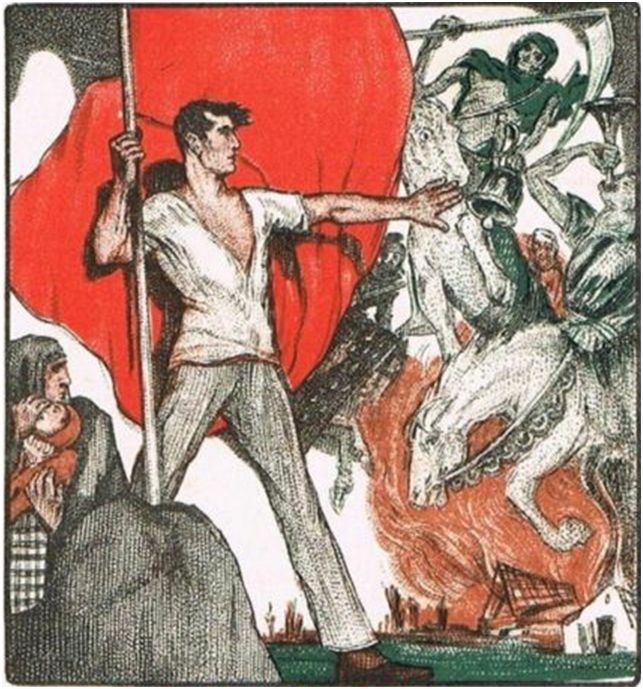 Spies noticed that the flyers contained the words “Workingmen Arm Yourselves and Appear in Full Force!” He ordered the copies destroyed and new ones printed without those words. Spies had consistently counseled non-violence. Most of the thousands of flyers distributed omitted the words, but a few hundred of the first run were circulated before they could be recalled. Then someone—it has never been determined who—threw a bomb from a side ally into the massed police. Five officers were killed and others injured. Police responded by firing wildly, wounding many of their own. About 60 officers were wounded—most by friendly fire, but so were dozens of workers, including Fielden. The crowd ran and Fielden limped away. The press went, predictably, berserk. The offices of the Arbeiter-Zeitung and regular meeting places and haunts of anarchists and unionists were raided. Police quickly rounded up much of the German leadership. A warrant was out for Albert Parsons, who had spoken at the rally earlier but was gone when the attack occurred. Parsons disguised himself and fled to Wisconsin. He later decided to turn himself in and stand trial in solidarity with his German comrades. 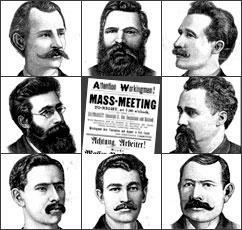 The men charged in the Haymarket case and the poster that called workers to the rally. In addition to Spies, Parsons and Fielden authorities charged Adolph Fischer, George Engels, Louis Lingg, Michael Schwab, and Oscar Neebe. Some of the defendants had not been at the Haymarket that night at all, and Neebe was out of town. 21 year old Lingg was known to be an advocate of propaganda of the deed and had written a provocative article in the Arbeiter-Zeitung advocating the use of dynamite. But he was not at the rally. The trial began on June 21 and was presided over by Judge Joseph Gary who made no attempt to conceal his animus to the defendants. Although no evidence could be brought forward linking any defendant to the bomb, prosecutors argued that they were in a conspiracy and that the defendants were guilty because they had not actively discouraged the unknown bomber. All eight men were convicted by the jury. Seven were sentenced to death and Neebe to 15 years in prison. Before sentence could be carried out, Lingg committed suicide in his cell by biting a blasting cap. After appeals had been exhausted, Illinois Governor Richard James Oglesby commuted Fielden’s and Schwab’s sentences to life in prison on November 10, 1887. The next day, November 11, the four remaining condemned men were led to a scaffold in a courtyard of Cook County Jail and hung. Their execution drew outrage and protest from the labor movement around the world. Illinois Governor John Peter Alteld, a pro-labor Democrat defied public opinion to pardon the surviving Haymarket defendents. 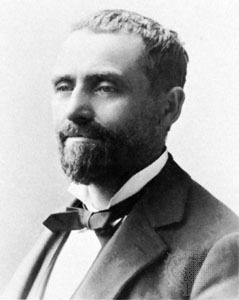 In 1893, Governor John Peter Altgeld, a liberal Democrat, signed pardons for Fielden, Neebe, and Schwab and concluded all eight defendants were innocent. The pardons and his opposition to calling in Federal troops to intervene in the Pullman Strike ended his political career. In 1898 Samuel Gompers, head of the newly reorganized AFL petitioned the First Congress of the Second International (socialist) to designate May 1 to commemorate the Martyrs of Chicago and support a new general strike call for an 8 hour day scheduled more May 1, 1890. The International enthusiastically agreed calling for “a great international demonstration” on that date. Huge crowds responded around the world including a march by tens of thousands in New York City. The event was so successful that it was made annual the next year and has been celebrated globally ever since. But in the United States, where May Day was born, the holiday was officially abandoned within a few years. Samuel Gompers stuck his historic deal with the employer’s organization, the Civic Federation, which gave craft unionists a “place at the table.” Part of that deal was the abandonment of May Day, now associated with Socialism in exchange for recognition of a non-ideological Labor Day in September around the time of a local New York City building trades celebration. A May Day rally in New York's Union Square in 1913. Industrial and militant unions like the Industrial Workers of the World (IWW) kept May Day, as did socialists of all stripes. Large celebrations persisted in many cities until the post World War II anti-Communist hysteria when the press successfully identified May Day with military parades in the Kremlin. In recent years, even conservative unions have revived the May Day tradition. The Chicago Federation of Labor funded a new Haymarket Memorial featuring a speaker on a wagon at the exact location of the original and hold annual commemorations there. Hispanic and immigration activists have staged huge marches for immigration reform on May Day, increasingly with the support of the labor movement. 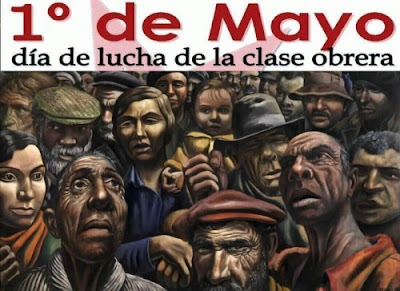 A poster for one of the May Day marches linked to immigrant rights in 2013. 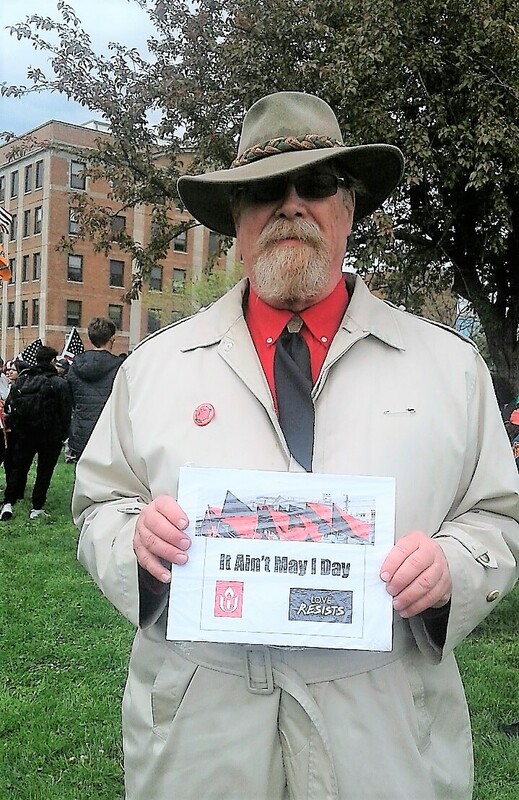 Last year in preparation for a huge May Day march in Chicago, I channeled by inner Carl Sandberg to answer those progressives who approved of immigrant rights marches on May First but clucked their tongues and wrung their hands that militant leftists would “damage the cause” by showing up at demonstrations with red or black flags and a chip on their shoulder. The Old Man at the 2017 Chicago May Dany March. It ain’t May I Day, Bub!